Tenkara and European nymphing, a link? Tenkara fishing is getting a lot of press, but the link to an ancient Japanese method to ‘modern’ techniques is very interesting. Tenkara and European nymphing – where the old becomes new. Sometimes it happens that some apparently disconnected events come together to open a door to something new. A case in point. I had been reading a lot about the Japanese Tenkara style fishing, and had bought a Tenkara rod and used it a few times, with some success. It is fun! The first article by a well known fly-fishing author and fly-tyer, was taking someone to task about his notion that wet flies tied with hackles pointing forward over the eye of the hook were ‘invented’ about 25 years ago. Not so wrote our eminent author, they were invented about 50 years ago in the Clydeside area, in the UK. Both these gentlemen were only about 2000 years out. 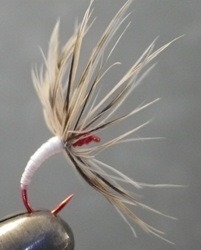 Japanese ‘Tenkara’ fishermen have been using wet and dry flies with hackles tied forward for around that many years. O.K. So a marginally interesting, piscatorial and historical matter cleared up. However this historical fact becomes more interesting when melded with the second article, on the ‘European’ fishing style.